We have a team of experts to keep your IT systems running at peak performance and your staff happily productive. Feel free to give us a call during office hours, or send us an email. 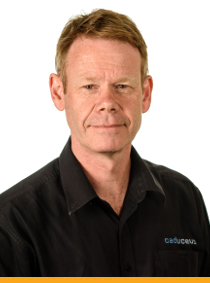 Grant’s experience has gained him a thorough understanding of the design and draughting needs of the New Zealand architectural, engineering and construction industries. 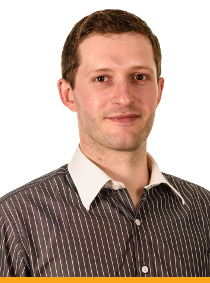 He particularly enjoys working on detailed and comprehensive construction documentation, with a keen eye for detail, resulting in the production of high quality, accurate and consistent building data. 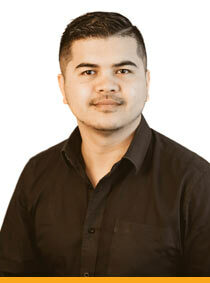 He is a highly qualified and experienced operator of Autodesk systems, including AutoCAD and Revit. Drawing productivity and management procedures is a specialty and he is a very skilled facilitator and trainer. 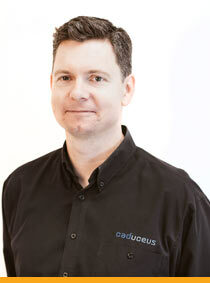 Matthew graduated from the School of Architecture, Wellington in 1994 and joined Caduceus as a CAD support technician. 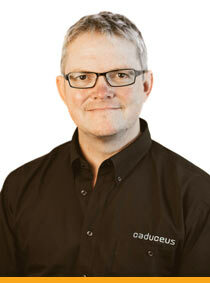 After a stint in Auckland, he returned to Caduceus in 2004 as a Director. 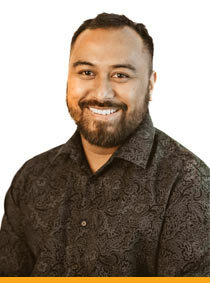 Matthew’s passion is systems integration and implementation of client business solutions. This includes design and implementation of Client Networks, Internet connectivity, VPNs, Web and Email Servers and Remote Application Hosting. His expertise includes setting up and maintaining Networks and Internet servers, backup management, distribution networks and remote access. Apart from his passion for his work, Matthew enjoys sailing, gliding, and of course, good wine and food. 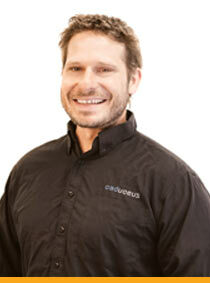 Alex has been in the Architectural profession since 1988 and is a highly experienced user of Revit & AutoCAD. He has worked on projects in Kuala Lumpur, Australia and New Zealand where his project involvement as a Documenter / Project Leader has ranged from high-end 600 unit apartment buildings to corporate fit outs. Alex is particularly good at understanding how teams work together to document a building project. He is a big picture thinker and also enjoys getting the details just right, skills which have been put to good use when crafting the RevitWorks tools and content. When Alex has spare time, he ensures he enjoys it. 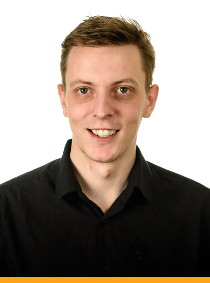 Dirk was born, bred and educated in Stuttgart, Germany gaining an IT Specialist Systems Integration degree in 2005. He moved to New Zealand in 2006 and after a short period in Auckland he saw the light and relocated to Wellington in 2007. Dirk is married with 2 young children and set up in his nest in Titahi Bay where he still finds time for cycling and sailing. David's passion in IT is networks, mainstream hardware and the technology we use everyday. He’s a people person and so enjoys his role of front line customer support and getting out and about to see clients. His other passion is golf and would quite happily play all day if he could. Outside of work, it's all about doing stuff with family, like riding the Waikanae river route or getting in some classic kiwi backyard cricket. 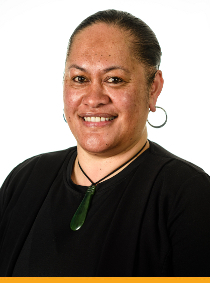 "The most satisfying part of my role is working with clients, ensuring they are valued and provided with the best possible service and outcome. Making a positive difference, building and retaining relationships is very important to me"
Away from the office, Damita is obsessed with triathlons and spending quality time with the family. Nick enjoys having strategic business conversations with our customers learning every piece of their business — past performance, current priorities and future goals. Unearthing the real issues and challenges they face and then putting together and implementing IT solutions that align with their requirements, goals and objectives. He has a Bachelor of Commerce with majors in Information Systems and Commercial Law, but more importantly, he understands what customers want from an IT provider. Nick’s spent the last 2 years focusing on moving small to large businesses to the ‘Cloud’ and the previous 5 focused on servicing law firms.